The American Faber Birren (1900-1988) probably wrote more books on colour than anyone else — in fact, about twenty-five. His first, Color in Vision, had already been published by 1928, and his final substantial work, The History of Colour in Painting, appeared in 1981. In 1934, Birren produced two works on the subject: Color Dimension and The Printer’s Art of Color, in both of which he introduces his own colour-system. This he describes as a «Rational Color Circle» which groups 13 colours around a grey which does not itself appear at the centre. The circle’s colours are yellow, yellow-leaf green, green-leaf green, green, turquoise, blue, violet, red-violet, red, red-orange, orange and orange-red. 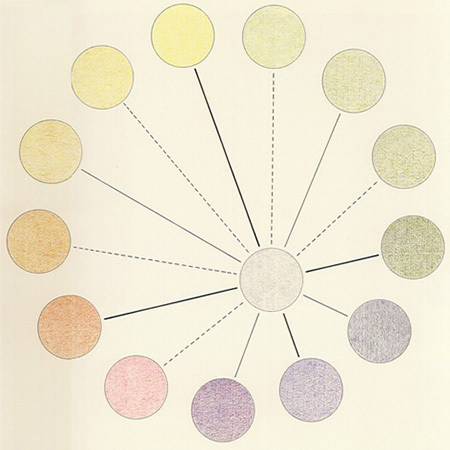 The thickly drawn lines in the diagram accentuate the psychological primary colours attributable to Ewald Hering, the dotted lines refer to mixtures, and the thinly drawn continuous lines represent secondary colours. Birren explains his colour-circle in accordance with the practicalities of art and artists. He first of all differentiates between warm and cold colours. Birren’s warm colours begin just to the violet side of red and extend beyond yellow. If a colour-circle is constructed using the three subtractive primaries of yellow, blue and red placed at equal distances, the warm colours will occupy about half the circle. If, on the other hand, a colour-circle is constructed using the four psychological and visual primary colours of yellow, green, blue and red, the warm colours will be suppressed and will occupy less than half of the circumference. The expression «point of complementation» points to the fact that the usual colour-circles become grey to the eye when they are rotated about their centre point — which thus becomes the point of complementation. Birren’s colour-circle does not become grey when rotated around its centre. In 1937, Birren introduced the triangular arrangements, which incorporate and display the visual and psychological relationships of colours. The seven names summarise the ways in which we can experience colours. Pure colour combines with white to produce a «tint». At the same time, the words «shade» or «tone» come to mind. Shade implies a dark colour, produced by tempering with black, and a tone is the result of combining a pure colour with a mixture of black and white. In the second triangle, Birren has assembled paired numbers which are separated by a decimal point. The digits preceding the decimal point relate to the proportion of white, which can range between 100 and 0. Similarly, the digits after the point indicate the degree of black. The actual proportions of colour can be calculated by adding both numbers and subtracting the result from 100. Accordingly, the combination 0.0 will be pure colour; 10.50 will give a colour-hue containing 10% white and 50% black, and thus 40% pure colour. The colour-triangle represents an attempt by Birren to reveal a harmony of colours. According to his ideas, a harmony can always be found by following the connecting straight-lines: in other words white-grey-black, or colour-shade-black. Birren thus endorses a generally held view that beauty is the result of good ordering of colours. It is, perhaps, the order itself — the actual colour system — which is beautiful. 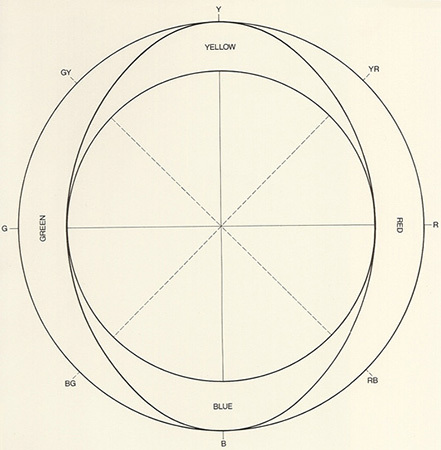 Date: The American art historian Faber Birren designed his «rational colour-circle» in 1934. 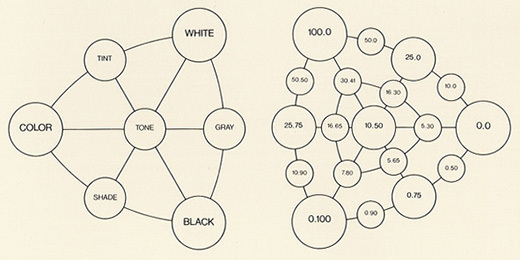 Bibliography: F. Birren, «Color Dimensions», New York 1934; F. Birren, «The Printer’s Art of Color», New York 1934; F. Birren, «Principles of Color», New York 1969.